Brazil's leading airlines were all facing big troubles after mounting losses and threats of bankruptcy during 2002. The country's major operator, Varig, piled up net losses of BRR$481.8 million (USD$209.6 million) in 2001, a 169 percent increase compared to 2000. VARIG blamed a global economic downturn, Brazil's currency devaluation and the effects of the September terrorist attacks in the US for its financial difficulties. Rival carrier TAM posted its first losses in 10 years (BRR$56 million) while VASP ended up with a negative result too. Transbrasil, which had been grounded since Dec. 2001 and with total debts (by April 2002) of over BRR$1 billion, could officially be declared bankrupt by a Sao Paulo court any day. The bankruptcy is being sought by its main creditor, General Electric, to which it owes around USD$45 million. A final decision over the airline's future will rest with the federal government, but the Department of Civil Aviation will have the right to withdraw the airline's license on June 3. Brazilian airline Transbrasil, on the verge of bankruptcy, found itself grounded in early December when jet fuel suppliers refused to extend credit. The airline already had reduced its fleet to five jets-a third of the number it had at the start of the year-and its employees had complained of payless paydays. 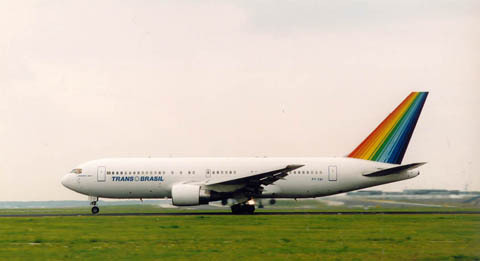 In a desperation move to recoup market, Transbrasil in late 2001 slashed its fares 69% on all flights. The International Air Transport Association (IATA) estimated that 85 percent of Latin America's 40 main airlines lose money while a third are technically bankrupt. Latin American airlines buy planes, spare parts and fuel in dollars, and sell their service in ever-weakening, local currencies. The result of this foreign exchange equation is simple: losses that force carriers to go into debt. It is a small wonder that in such an economic environment, airlines fail. But what a sad event for a company that managed to survive since the 1950s ! Source: various news items on the Internet. The company was started as Sadia by Omar Fontana in 1955 with one DC-3 meat hauling from Concordia (his father's meat packing factory) to Sao Paulo and other markets. In 1963 he replaced the DC-3 with two British Handley Page Heralds and later he changed the name to Transbrasil and operated his jets over the South American continent and across the oceans to the United States and Europe.